The Drager X-dock series provides you with full control of your portable Drager gas detection instruments. Automatic bump tests and calibrations with reduced test gas consumption and short testing times save time and money. Comprehensive documentation and evaluations provide you with a clear overview. AS VERSATILE AS YOUR REQUIREMENTS - The X-dock is available in a wide variety of versions. The X-dock 5300 includes a master station including a module for a gas detection instrument from the X-am 1/2/5x00 or Pac family. It is immediately ready to use. 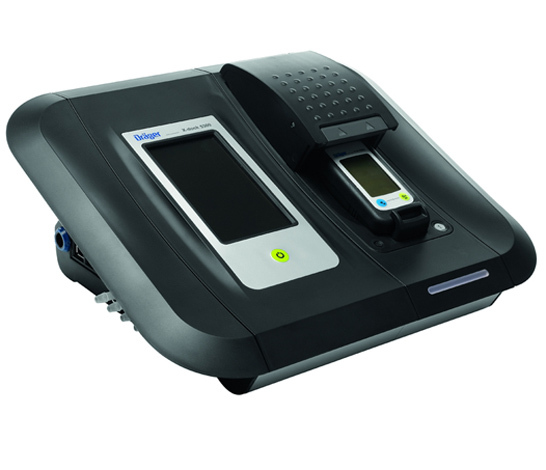 The X-dock 6300 and 6600 versions can be configured freely. They consist of a master station and can be expanded with up to 10 modules for X-am 1/2/5x00 and/or Pac1 gas detection instruments. EASIER THAN EVER BEFORE - Insert the device, close the lid and remove it when the indicator goes "green" - a test with the X-dock is just that simple. It immediately detects all sensor combinations. Furthermore, the X-dock automatically tests and adjusts when all required test gases are connected. The station works independently and can be configured and used without a PC. The station is operated via an integrated touchscreen. A gas detection instrument is detected as soon as it is inserted, and all data is documented in the database. MORE SAFETY THANKS TO COMPLETE DOCUMENTATION - Do you need to document whether or not your devices are ready for operation? Who tested which device when, and what the result was? The X-dock stores all of the relevant data and reads the collected information from the gas detection instruments for subsequent evaluations - providing you with complete control every step of the way. You can use the reporting function (report wizard) to create customised reports. Furthermore, you can print a calibration certificate right at the stations, since the Xdock series supports standard PostScriptcompatible USB printers. This functionality allows the user to manage all requirements of EN 60079-29-1 and EN 60079-29-2. AUTOMATICALLY REDUCED COSTS - With a reduced gas flow (300 mL/min instead of 500 mL/min) per module, you save costs on test gases. Short testing times reduce the overall maintenance efforts. The valve concept (patent pending) requires one pump only, resulting in the need for less wear and tear parts. The valves automatically switch the test gases and - when connected - the compressed air as well. SIGNIFICANT TIME SAVINGS - Up to 10 modules can be connected to the X-dock at any given time, allowing you to test gas detection instruments simultaneously but also independently of each other. The automatic bump test also saves time, because the test only takes 8 to 15 seconds*. All Drager test gas cylinders are already stored in the database - entering the part number will automatically fill in the fields required for the gas configuration. This eliminates the need for manual data entry. OVERVIEW OF RESULTS - The additional "X-dock Manager" software offers you even more comfort: It produces a detailed evaluation of the data in the calibration system and gas detection instruments, and presents the information in various graphics and statistics - providing you with a complete overview of all results. All connected X-dock systems can be connected in one network. Therefore, the data is not only stored locally in the system, but in a central database as well. With the X-dock manager you are always in control.